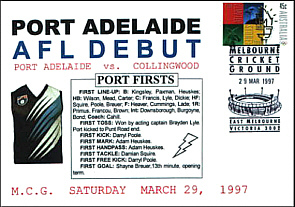 Port Adelaide's First AFL Game was held on the hallowed turf of the MCG on the 29th March 1997. 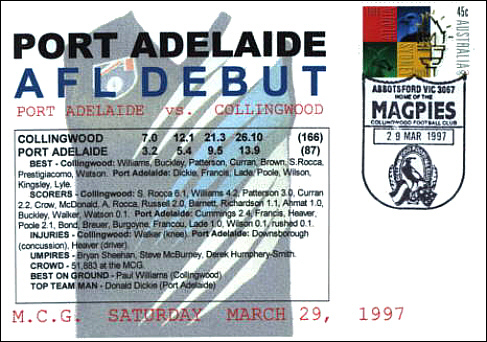 It was a match of the SA Magpies (Port's SANFL nickname) versus the Collingwood Magpies. 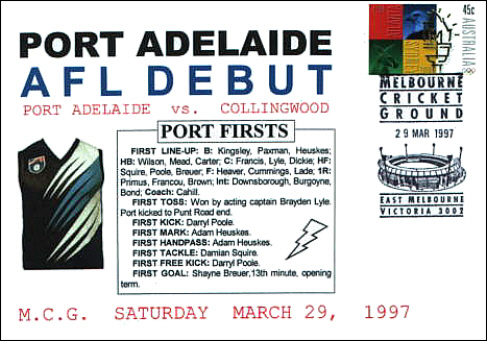 Collingwood was very adamant about Port having to drop its Nickname and its famous black and white jumper, although it was a different design to theirs. A double set of 50 covers was produced to mark the special occasion. 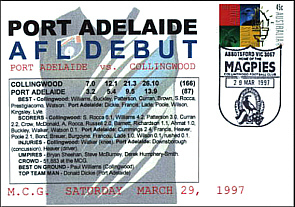 The first cover was cancelled with the Collingwood Permanent Pictorial Postmark (PMP 635) and is shown below. The second cover in the set was cancelled with the MCG Permanent Pictorial Postmark (PMP 458) and is shown below.